One way to cope with the problem is to grow drought-tolerant plants. These tend to put on growth in spring but have reduced water needs in summer and are typically from areas with a Mediterranean climate – cool, moist winters and hot, dry summers. Many drought tolerant plants have silver or grey-green leaves, their light leaf colour reflecting the harsh rays of the sun. Some have a coating of fine hairs on their leaves or stems, helping to trap moisture around the plant tissues. 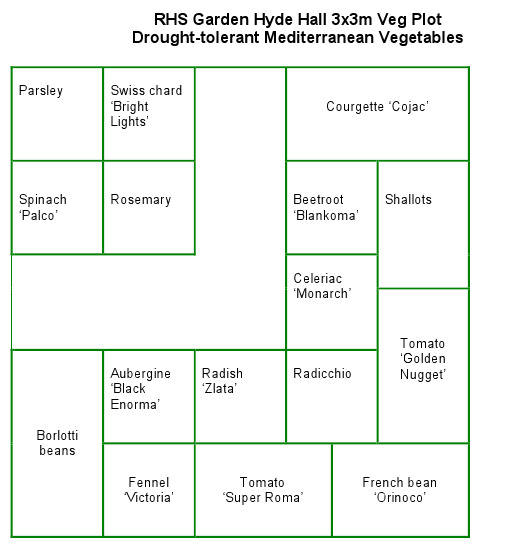 The RHS have completed a trial of drought tolerant vegetables. See the table right. Many plants have adapted to drought conditions – here are some examples of how plants have evolved to cope with much less water – many of which are suitable for growing on your allotment. Don’t forget that plants are much better than weeds – which take water from the soil – so grow ground cover plants such as Stachys byzantine (lambs ears) instead. You can often pick a cutting or two up from a friend and start them off in a pot before planting them out. Small leaves shed heat and have few pores from which to lose water. Good examples are Rosmarinus officinalis (rosemary) and Thymus (thyme). Long, narrow leaves are very good at shedding heat without losing water. Plants with these include grasses (eg. Helictotrichon sempervirens) and phormiums. Grey leaves usually signify drought resistance. They can typically be seen on Artemisia, Lavandula (lavender), and Verbascum. Hairy leaves shade themselves with their own hairs. Verbascum bombyciferum and Stachys byzantina (lamb’s ears) are just two easy-to-grow examples. Leathery foliage loses less water than soft leaves. Look out for plants such as Salvia officinalis (sage) and Cistus ‘Silver Pink’. Waxy leaves have a shiny surface created by the waxy cuticle in which they are enveloped. This reduces evaporation, particularly in windy conditions: examples include pine trees, Pittosporum , Acacia and Eucalyptus. Fleshy, succulent leaves store moisture for dry spells. Sedum spectabile (ice plant) is a hardy example, while Aeonium can be grown outdoors in summer. Aromatic leaves contain volatile scented compounds that are thought to cool foliage as they evaporate, reducing water loss. Try Cistus and Lavandula. Spikes act as ‘cooling fins’, ensuring plants like Acanthus spinosus (bear’s breeches) and Eryngium oliverianum (sea holly) lose heat but not too much water. Slow growth By restricting growth of both stems and leaves, plants can conserve limited supplies of water (e.g. many cacti and succulents, including Sempervivum arachnoideum). Underground storage organs enable plants to save water for long periods of drought (e.g.daffodils, Dahlia, Eremerus). Legumes – Broad beans and peas need lots of water at flowering time in order for pods to set and, again, two weeks after flowering begins. As young plants, avoid too much water as this can encourage leafy growth and reduce the yield. Runner beans need constant moisture for pods to set, whereas French beans are less sensitive to some dryness. 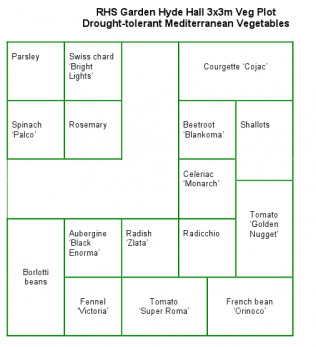 Stem vegetables – Celery, celeriac and Florence fennel need water during growth. Periods of drought stress are very damaging and should be avoided – it can lead to bolting or poor quality crops. Curcubits – Courgettes need constant moisture all the way through to harvest. Marrows, pumpkin and winter squash benefit from watering but, in practice, often produce fair fruits from minimal watering. Trailing types need less water as their spreading habit conserves moisture and the stems root where they touch the ground. Fruiting crops – Aubergines, sweet corn and tomatoes all need watering well to aid establishment and also at throughout the flowering and fruiting period. Leafy crops – Cabbages, chards, lettuce and all salad crops need water at every stage of growth. If water is especially short, make sure that you soak the ground around cabbages and lettuces when hearts begin to form. Regarding the article…. it was indepth and has helped out a lot. I have found that in the past when I have not been able to water I have had fruit and veg. though they are smaller and less in volume but it is not the end of the world. In a commercial point of view its a disaster but in an allotment situation its all good. Maybe next year you can take the following steps above.